Two years after a show devoted to Swiss artist Jean Tinguely, the cheerful and colorful universe of Niki de Saint Phalle  Tinguely’s wife and artistic collaborator  has come to the Museo in Erba in Bellinzona, Switzerland. Le scatole dei segreti di Niki de Saint Phalle, a child-friendly exhibition in the form of an interactive game, is the fruit of a collaboration between Lausanne’s Center Culturel d’Aide à la Jeunesse and the Musée en Herbe in Paris. It consists of 14 modules exploring the artist’s work, short texts and games. The show gives autonomous, active children a rare opportunity to dive into an artistic universe full of life, joy and color. The exhibition, which opened 12 September 2009, will continue through 28 February 2010. Learn more. 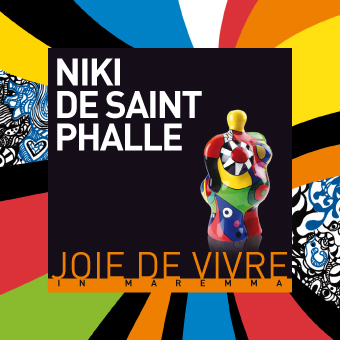 Niki de Saint Phalle: Joie de Vivre, a solo exhibition of work by Niki de Saint Phalle that came to the Fortezza Orsini in Sorano, Italy on 22 August, has been extended through 26 October. 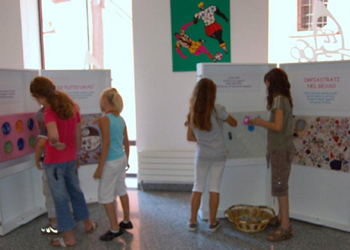 The exhibition was shown in three venues in the Province of Grosseto, Italy, over the summer. It appeared at the Palazzo dell’Abbondanza in Massa Marittima, Italy from 31 May to 28 June 2009. It then moved to the Castello Aldobrandesco di Arcidosso in Amiata, Italy on 4 July, remaining until 19 August.